Hey Sugas!!! If you follow me on Facebook or Instagram, then you know my fabulous husband, the Kings of Nails 82, Jason. Every now and then you can catch him hanging shelves in my nail office, driving to PC or being obnoxious, I mean funny, during my live videos but through it all, he’s a great sport. and I love me some him! And yes, I’m beefing up all the adjectives and sappy love stuff in this post to make him sound like the amazing gem he really is….and also just in case he reads this, he’s may fell inclined to let me buy more polish…lol. But regardless, Jason is my better half, the one that keeps me sane and grounded and the one that has been my cheerleader throughout my nail journey. Over the years and through the countless bottles of nail polish, Jason has made comment to some of them that he really likes. So I decided to put him to the test. I challenged him to chose 10 of his favorites. He’s reaction was priceless. “How am I supposed to chose only 10 out of the thousands of pictures you’ve posted?” he asks. After the sucking of the teeth and rolling of the eyes, all I heard was “oh” and ” like this one”. Without further adieu, here are the King’s Choices! I also wanted to take a moment to thank all the ladies and gents, near and far, that have not only done a gray mani, but for all your thoughts, kind words, prayers and virtual hugs – they mean more to me than you know. Due to the amazing response of gray manis, I will be posting multiple collages at the end of the month on IG of those that took part in the challenge with me – rust me, they will know your socks off! If you haven’t already done a gray mani, there’s still time! 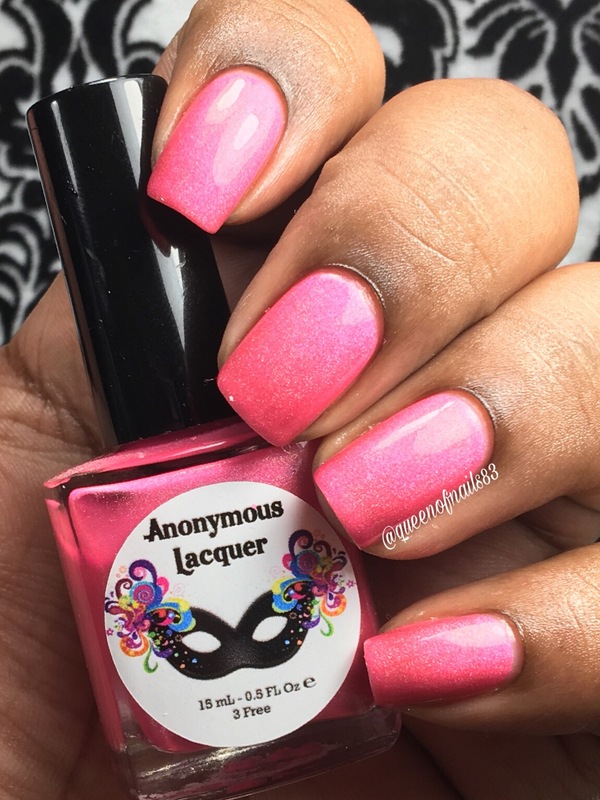 Keep reading to find out all the details and how you can help spread awareness, support the cause and treat yourself to some great nail polish and nail care items from 2 amazing indie brands! For the full story of my dad, Michael, visit my original blog post, here. Good Afternoon and happy 1st day of May, I hope this post finds you all well. This is a very impromptu post so forgive me if it appears rushed. I wanted to share something personal about me and someone very near and dear to my heart. If you follow me on IG then you already know what this is about…. Hello December!! Since I have a little break between pr samples, I decided to do some nail art inspired by this festive holiday and share with you, my friends! Today is the 4th day of this celebratory month and I have my first of many holiday/winter manis. I’m super excited about this mani because I was able to use one of my new Lina plates and can I just say, I love it! Lina has become one of my favorite brands and I use this brand religiously in my Swatch & Review series. I also tried my hand at another nail art technique that I don’t use enough, foiling! So let’s see how I did! Hey y’all, today’s post is going to be so quick it’s gonna make you head spin. Simply because I woke up this morning and realized I didn’t have a post ready. First, Happy Belated Resurrection Day/Easter! I hope that you all had a relaxing holiday weekend. Mine was amazing. My son’s first AAU tournament of the season was Saturday and the 14u Hoyas won all 3 of their games. I do hope this is a preview of what is to come. Sunday, we went to church and then my family came over for a cookout. We laughed, ate and made new memories. I love spending time with loved ones, it makes my heart so full of joy. This was my first purchase from Bliss Polish and I must say, I’m thoroughly impressed. This collection was released at Indie Shop ATL and Yvette, maker and creator of the brand, did a presale simultaneously on her site for the collection at an astonishing price of $40, you know I had to jump on them. 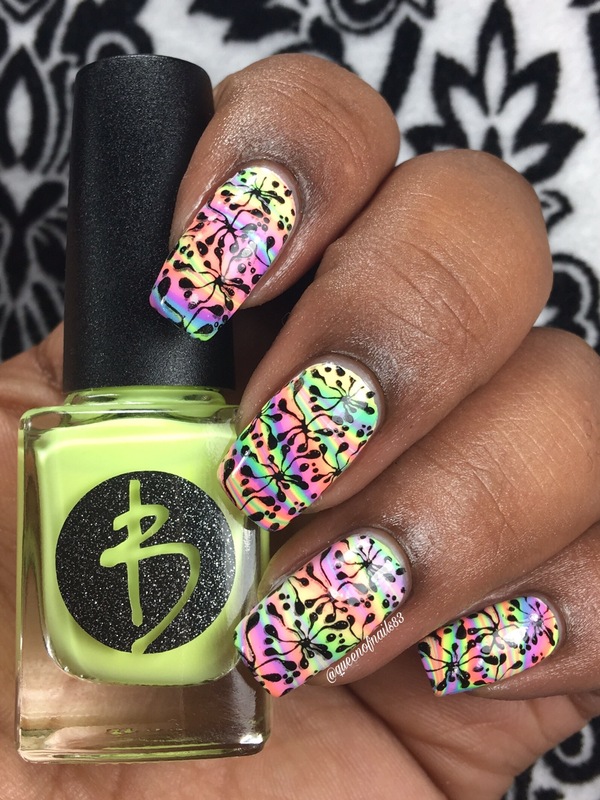 When I posted this mani on IG and FB, stamping of the collection was also asked about. So I did some quick and dirty testing over both black and white. There you have it, quick, easy and full of awesomeness! I’m so excited to share this mani/tutorial with y’all today because its been a long time in the making. The day before I completed this mani, I gave myself a “full spa manicure” at home complete with mani bomb. The secrets to my at-home mani can be found here, but enough about that, lets talk about the inspiration and how I created this mani. I was inspired by a leotard that I saw while attending my youngest daughter’s gymnastics training session. Let me tell you, with all the bright, bold and fun printed leos (its what all the gymnasts call leotards…lol. 5 and 6 year olds are such a hoot), I could create a whole series just trying to re-create them for a mani. Hmmmmmm! I’ll tuck that idea in my back pocket. Because I used neons, I started with an even, thin layer of white to give the bright colors a POP! Once that was dry, I applied 3-4 small drops of each color to my nail and used a stamper to smoosh the polish and blend the colors together. This part is a lot of fun and you don’t have to worry about it being perfect because there is no right or wrong way to do this step. I tried no to “over smoosh” because I didn’t want the colors to look to “muddy”. This step can also be done use saran wrap or plastic bag. I have also put the polish on the stamper then applied to the nail, but again, whatever works for you is great. Once I was happy with all 10 nails, I applied a coat of quick drying topcoat to smooth out the polish. I used the first Lina plate, Feeling Shapely 02 and black stamping polish to complete the first image. 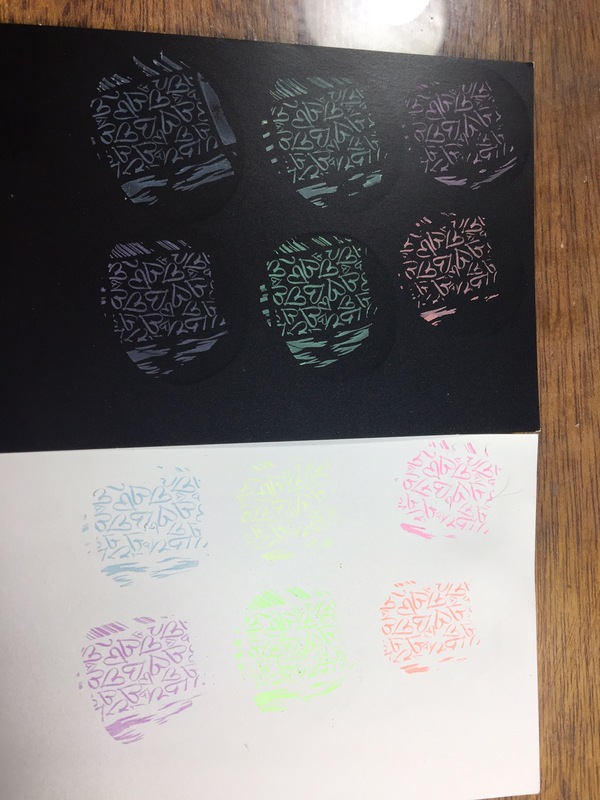 Then I used the second Lina plate, Make Your Mark 01 and the Prism Drops to apply the 2nd image. Finally, I topped with a final layer of topcoat and cleaned up. 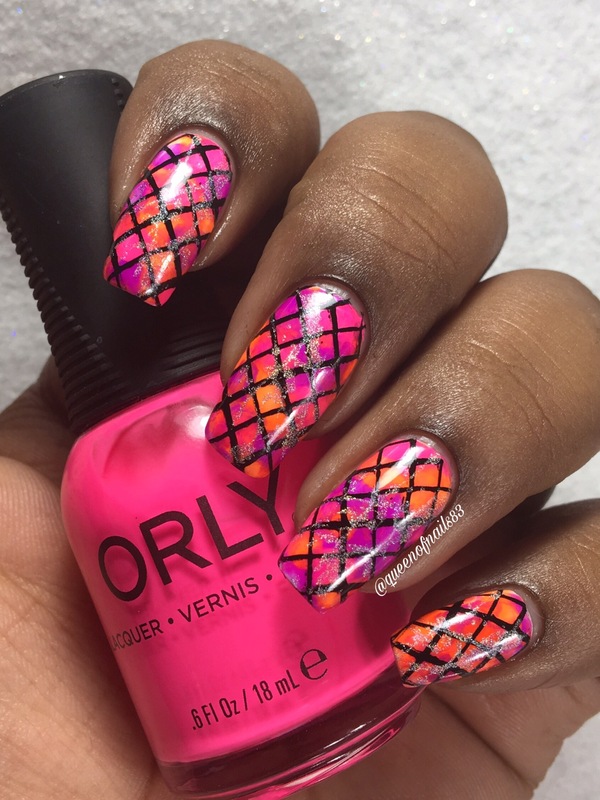 Well, there you have it a complete neon mani inspired by a gymnastic leotard. As a nail addict, I find myself finding inspiration from a lot of different things, I hope you continue to join me on this series I bring you more Be Inspired/Be Challenged manis. I, like many other nail addicts, love a good gradient. 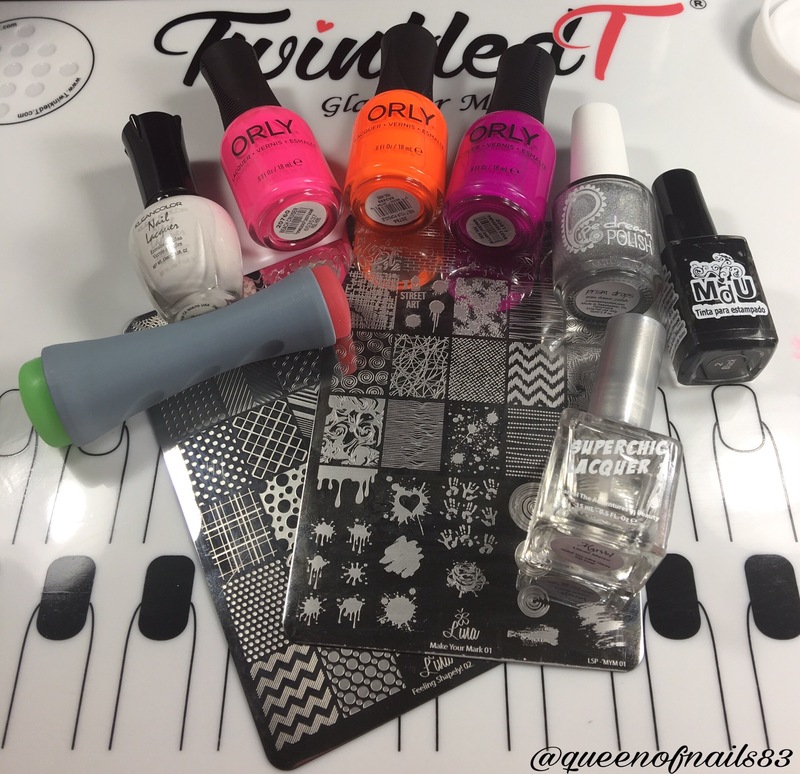 From the color choices to the flawless, seamless blends, a beautiful gradient adds a fun and exciting element to any mani. For this mani, I wanted to take it up one step and instead of using crèmes, I wanted GLITTER!! 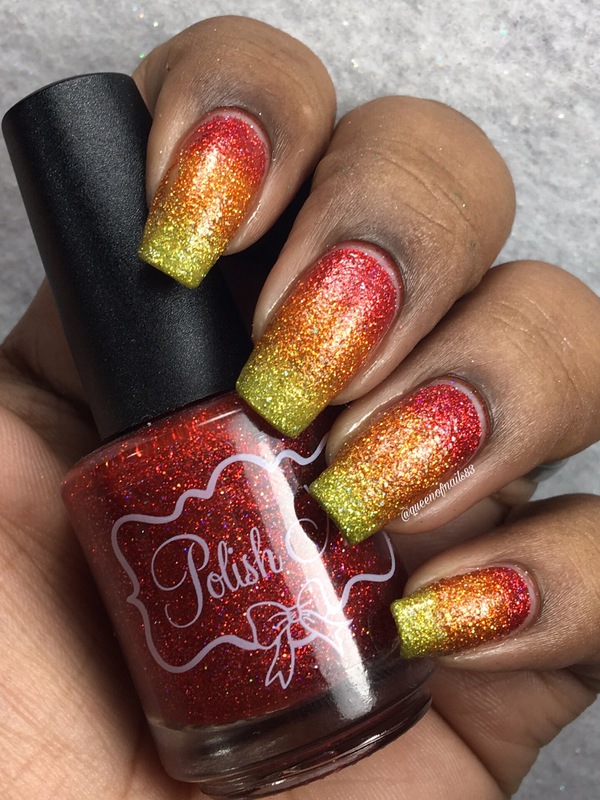 So what better polishes to use than a few from the Christmas Collection from Polish M. I purchased this collection during the Black Friday sale as it was #1 on my wish list. 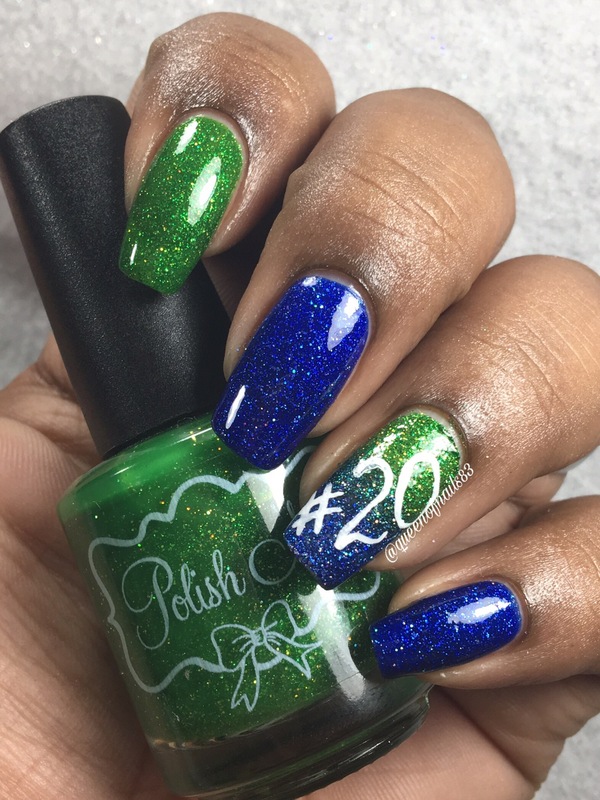 Previously, I had done a mani to celebrate my sons first middle school varsity basketball game. I loved the way it turned out. Once I saw how effortlessly these applied and how opaque they are, I knew more gradients would be in my future. With the holidays wrapping up, I decided it was time to put away the red and green polishes, the snowflakes and snowmen and do something…a little sassy. For starters, I applied 1 layer of sticky basecoat and then Guardian around my cuticle to protect my skin and make for easy clean up. Next, to my makeup wedge, I horizontally applied Here Comes Santa Claus (red), Grandma Got Run Over by a Reindeer (orange) and Little Drummer Boy (yellow). Then in a rolling motion I applied the polish to each nail until I reached the desired opaqueness and topped with a single layer of topcoat. At this point I removed the latex and began to clean up. While I was in love with this gradient, I knew it wasn’t complete. I took to the Polish M facebook fan group to ask for suggestions as to whether or not I should add nail art. 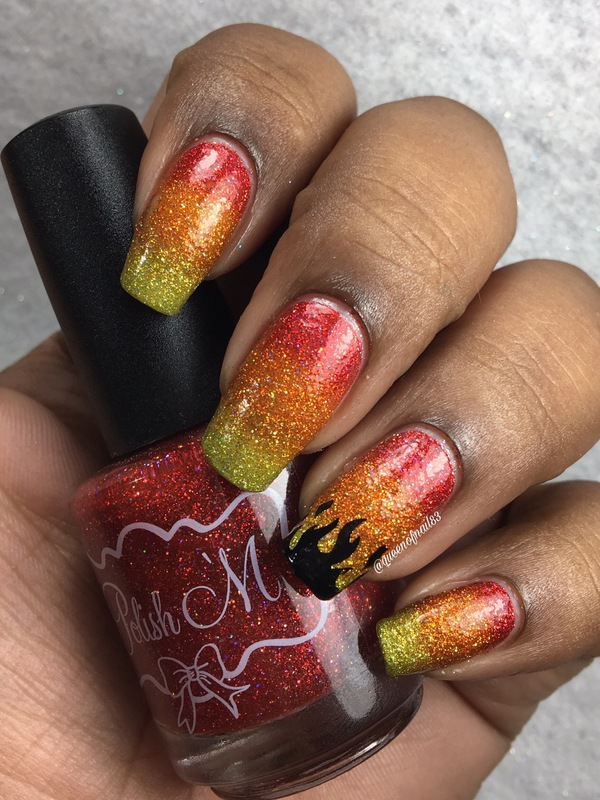 With the help of a fellow addict, I decided to add the stamped flames to an accent nail. I hope you enjoyed this little tutorial. Are there any techniques you’d like me to try and feature in this series? We took some time off from challenges for a while over at Those Nails Though (TNT), but we are back with a vengeance now. This is just in time because I know I have deprived you of challenge Nails for the past few months. Yes, I know Challenge/Inspiration Nails is supposed to be at the end of the month but I loved this mani too much not to share it sooner. I thought what better way to celebrate than with a Breast Cancer Awareness mani! To start this mani, I applied 2 coats of Perez Pink over my base coat and topped with Topped with Love. Once that was completely dry, I stamped in white the quatrefoil-esk image from the Super Placa B plate. Then I applied a single metallic pink ribbon in the center. Using the clear stamper, made this mani super easy. I love this mani and think it turned out great. What do you think? 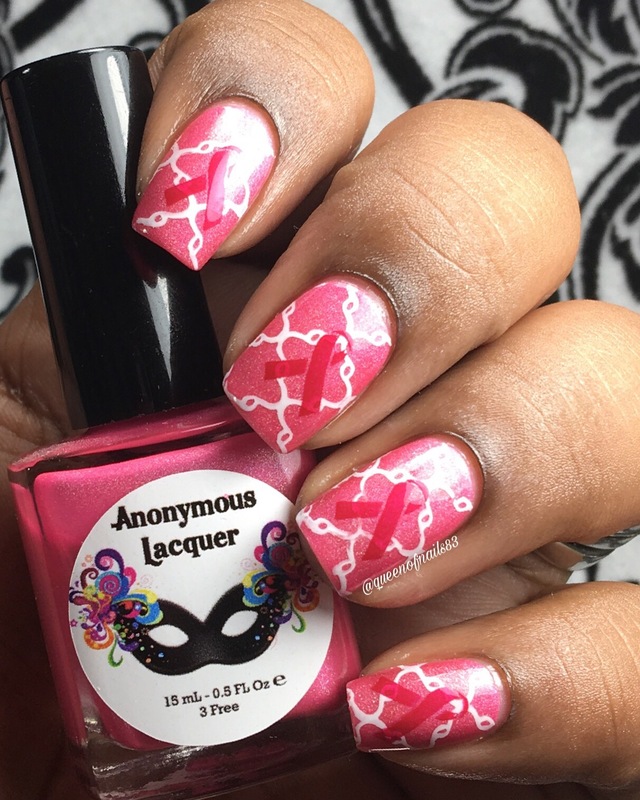 Are there any causes you do a mani to raise awareness for? What are some of your favorite challenges to participate in? Join the fun, join and follow Those Nails Though! Good Morning! Today I have a special treat for you all. 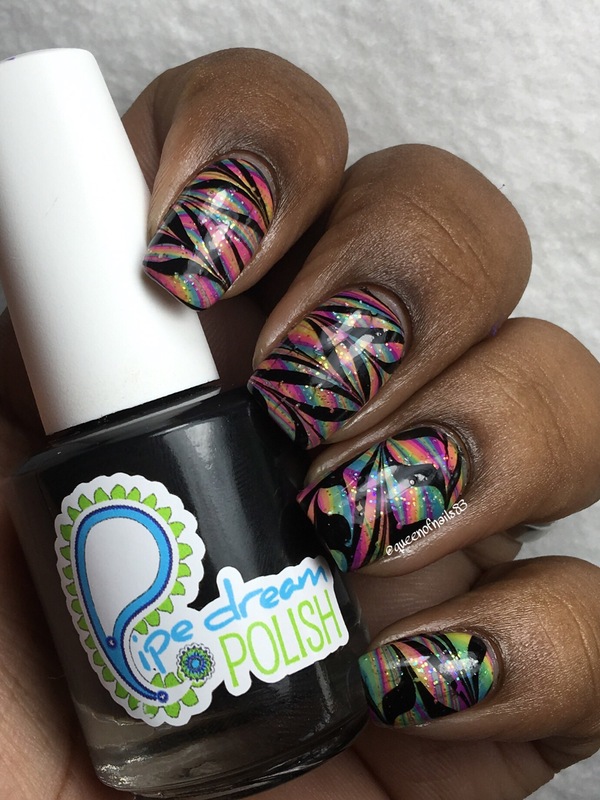 I am going to show you yet another attempt at watermarbling using the newest collection from the awesome indie brand, that brought you the highly coveted collections, A Night In Vegas (ANIV/ANIVC), Street Carnival (SCC) and Mellowed Out Cremes (MOC)….Pipe Dream Polish (pdp). 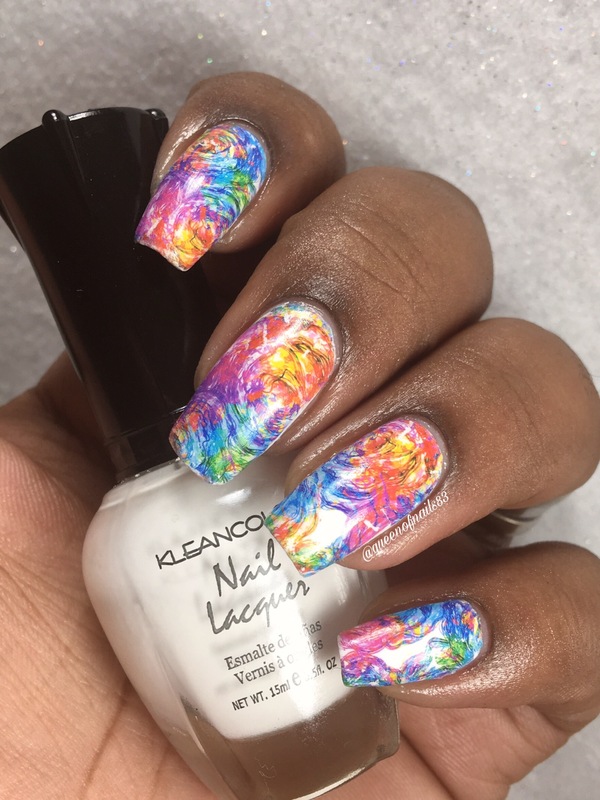 This watermarble mani features the Tie-Dye Jellies collection, that I was lucky enough to score on its release day, June 29th. It wasn’t until I had already done my nails and I was so happy with the outcome, that I decided to make it a tutorial and share here. So, please bare with me as I try to explain my way through. I prepped my nails by putting down 1 coat of Whitewater by pdp and applied Cat Suit by Vapid around my cuticle and down about 1/3 of my finger front and back. I found the area that I liked the most and placed my finger in the water at an angle to pick up the design on my nail. Then, I blew on the surface of the water and picked up the excess polish with my q-tip. I repeated these steps for each finger and cleaned up using my clean-up brush and acetone. Finally I topped with by QDTC by Pro-FX. Use room-temperature water – I have tap water in an old gallon jug that I keep water in to ensure is the right temperature. Have everything ready – design tool (i.e. toothpick, needle), q-tip, etc. NOT ALL POLISHES MARBLE – there is nothing you can do about this. Don’t get frustrated, just find ones that do. Do you have any best practices? What polishes do you find work best? 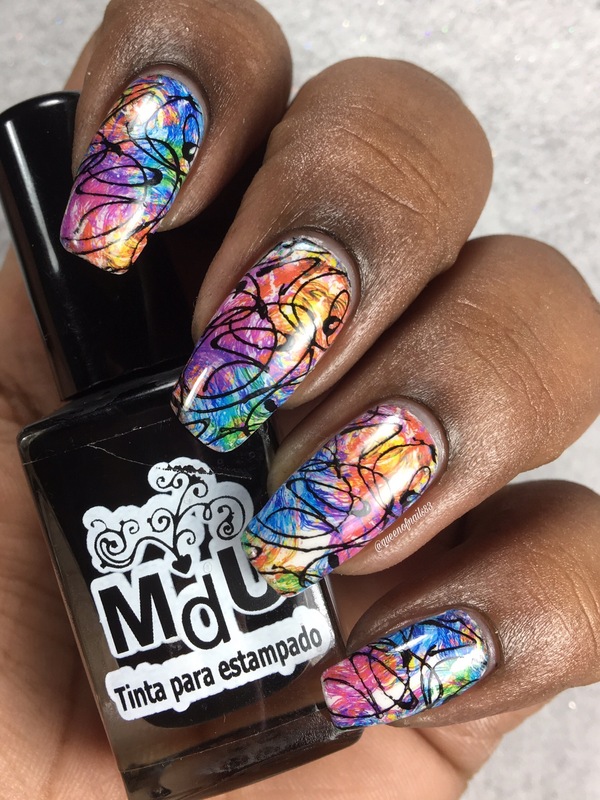 I few days later, my watermarble mani was still in really good shape and I was so proud of it I didn’t want to take it off. So I decided to upcycle (upgrade + recycle) this mani with a DOUBLE WATERMARBLE!!! Did your head just explode, because mine did at first. I figured how are hard could it be? 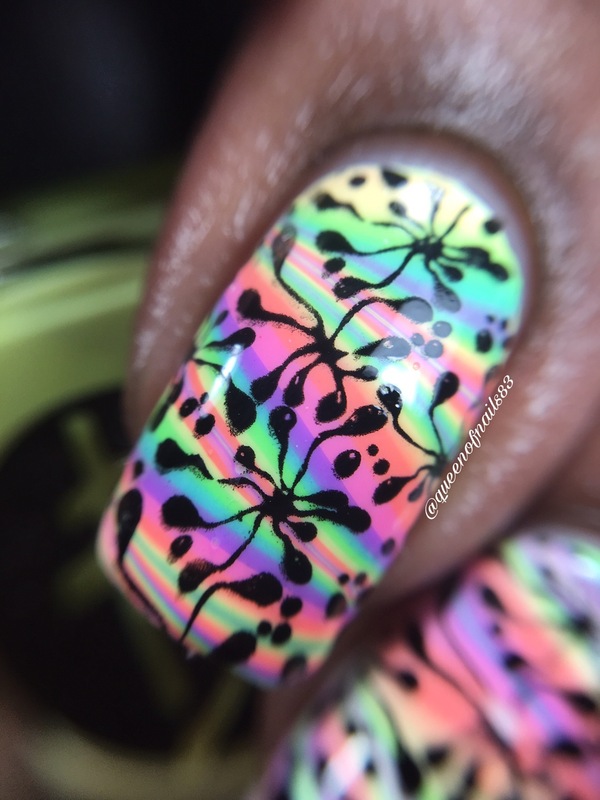 I used the same steps outlined above with Atrament and Clearwater (both by pdp) and wha-la…I have a double watermarble mani! Thoughts?